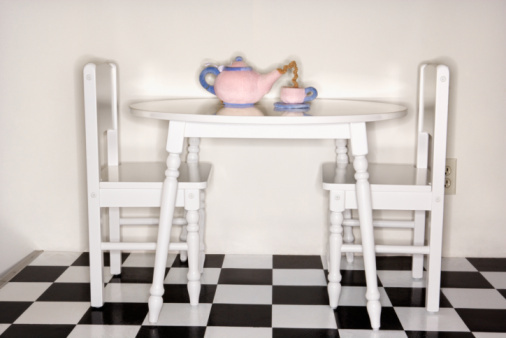 Kitchen chairs take a beating, especially in a home where there are children. The cost to replace them can be high. 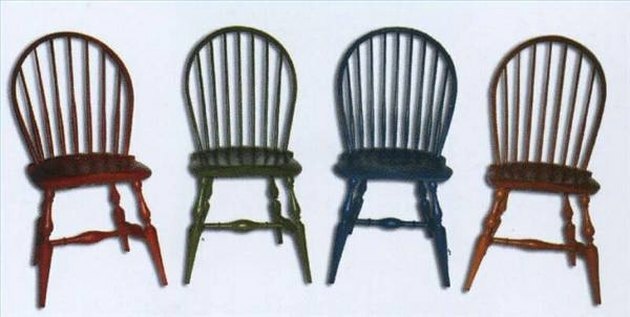 If you want a new fresh look for your kitchen chairs but can't afford to get new ones, paint the ones you have now. It is easy and cost efficient. So if you have a weekend to spare, then all you need now are the right supplies and a little direction to get you started. Set up a worktable in an area that is well ventilated. Place painter's plastic on top of the worktable to protect it from paint. You can also place the plastic on a hard surface floor if you do not have a worktable. Wash chairs thoroughly with warm soapy water before you begin the finishing process. This is important to do so that any grime and stuck-on food will not affect the look of your paint once it has dried. Substances, such as syrup, can actually cause the paint not to dry. Allow the chairs to dry completely. Fill in any chips or gouges with wood putty. Glue and tighten any loose legs and spindles. Sand chairs down with a 220-grit sandpaper. The idea of this sanding is not to remove the finish already on the chairs but just to roughen it up so that the primer and paint will adhere better. Wipe the chairs clean with a tack cloth. Apply the primer with a 2-inch foam brush. Apply the primer in the direction of the grain on your chairs. Allow to dry and cure for 4 hours. Apply the first coat of paint. Allow to dry for 4 hours or until the paint is totally dry to the touch. Buff the chairs after first coat of paint is dry. Wipe clean with a tack cloth. Apply a second coat of paint. Allow to dry for 4 hours or until totally dry to the touch. Buff the chairs again, wiping them totally clean with a tack cloth. Apply a third coat of paint if necessary. Most light-colored paints, especially white, will require more coats than darker-colored paints. If you can still see a hint of the old stain or finish coming through, apply another coat. Allow paint to completely dry. Apply a light coat of oil-based polyurethane using a 2-inch foam brush. Watch the polyurethane carefully for drips until it begins to thicken up. Allow the polyurethane to dry for 12 to 24 hours, depending on weather conditions. Polyurethane will take longer to dry when the humidity is high. Apply a second coat of polyurethane. Allow to dry for 12 to 24 hours. What Is the Height of a Standard Kitchen Chair Seat?